Viktor Felixovich Vekselberg (born 14 April 1957) is a Ukrainian-born Russian businessman. He is the owner and president of Renova Group, a large Russian conglomerate. According to Forbes, his fortune is estimated at $13.6 billion, making him the fourth richest person in Russia, as of August 4, 2015. Vekselberg is close to the Moscow Kremlin, overseeing projects to modernize the Russian economy. Viktor Vekselberg studied at the Moscow Institute of Railroad Engineering in the 1970s. He made his first million selling scrap copper from worn-out cables. He led Russia's first successful hostile takeover in 1994, when his Renova firm took control of the Vladimir Tractor Factory and installed a Russian-born Harvard M. B.A. to run it. He later bought several medium-size aluminum smelters and bauxite mines, united them into $1 billion (sales) Sual Holding in 1996. That group eventually became part of one of the world's largest aluminum producers, UC Rusal, in which he still has a stake. Vekselberg got $7 billion in cash when he and his partners sold their 50% stake in joint oil venture TNK-BP to state-owned Rosneft in 2013. He invested some of the proceeds into companies like Swiss industrial firms Sulzer and Oerlikon, Swiss steel company Schmolz+Bickenbach and Italian firm Octo Telematics, which makes software for insurance companies. Vekselberg owns a large art collection, including nine Faberge eggs he bought from the Forbes family for $100 million. The Russian billionaire intends to sue the banks that have blocked several billions of dollars on his accounts and accounts of his companies. Viktor Vekselberg did not have personal accounts in Cyprus, his representative said. Earlier, the US Treasury reported that the bank accounts of Vekselberg and Oleg Deripaska in Cyprus were frozen after US sanctions. 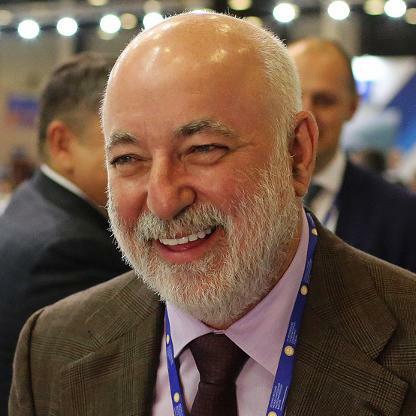 Beluna Investments Ltd, a member of Renova Group of companies Viktor Vekselberg, on August 15, reduced its stake in the power company Hevel from 51 to 46%. Energoprom Group of Viktor Vekselberg and Leonard Blavatnik will retain its status as a monopolist in the market of graphite electrodes in Russia. For this, eventually, Russian metallurgists will pay. The deal for the sale of part of the only foreign shipyard USC - Finnish Arctech Helsinki Shipyard - scheduled for July was not held. The terms of the agreement with the Croatian partner of the oligarch Viktor Vekselberg changed at the last moment, and not for the better, and Moscow sent to Helsinki auditors with a large-scale inspection, suspecting fraud. Why did his post leave the editor-in-chief of the newspaper Kommersant, Sergei Yakovlev. Corrupted in the corner by American sanctions, the oligarch intends to merge his energy assets with the company Gazprom energoholding, having received a blocking stake for it. Vekselberg became the only beneficiary of Russian assets "Renova"
Minority shareholders exchanged shares in the structures of Renova for packages in the Swiss holding Liwet Holding. The oligarch's structures were included in the AtomGarant NPF. The businessman intends to sell his last property in Moscow. According to the Associated Press, which did not disclose the source of its information, it was such a ridiculous amount spent in the US by a Russian oligarch. The businessman considered "state aid" bonded. Earlier Viktor Vekselberg received from the bank up to 1 billion dollars. Pavel Maslovsky can again return to the operational management of the gold miner Petropavlovsk. Ex-Senator from the Amur region agreed to take the post of CEO of the group, torn apart by the corporate conflict, which he left in 2017. Yesterday Vladimir Putin signed a law on counter-sentences. Forbes estimated how much the richest people of Russia who were under sanctions in April lost, while the Duma and the Kremlin came up with the US response. Member of the Supervisory Board of Alfa Group, Herman Khan, talked about his attitude to the Kremlin list, the reasons for increasing the role of the state in business and how much the Wintershall DEA could cost. Renova's lawyers are already preparing lawsuits against Swiss banks and their employees. According to experts, the chances of obtaining compensation for losses in court are not high. A professional oligarch bought out a share of toxic Vekselberg in an IFC bank. EN + Group follows the advice of the US Treasury and replaces its representatives on the board of directors of the aluminum company with ordinary employees. Due to sanctions, the company may have problems with the tele-business.